Why is The Hindu a dutiful child with bright, shiny and healthy teeth? Because, it mostly copies The Guardian and pastes a lot. Update: I am informed by James that the amount of copy pasting is not enough to warrant the joke above. So readers be informed that the above exists just for joke’s sake. Don’t we have crossword setters who set their cryptic clues with much more localized context. Imagine the possibilies for subtle and allusive clues with all our diversity. ps: Readers who are not fans of cryptic crosswords, it’s a little hard to squeeze in a guide in a blog post. But suffice to say that solving a good cryptic is one of life’s great pleasures. Cryptic crosswords stretch one’s brain into interesting shapes and directions as they demand quite a bit of lateral thinking. For e.g. 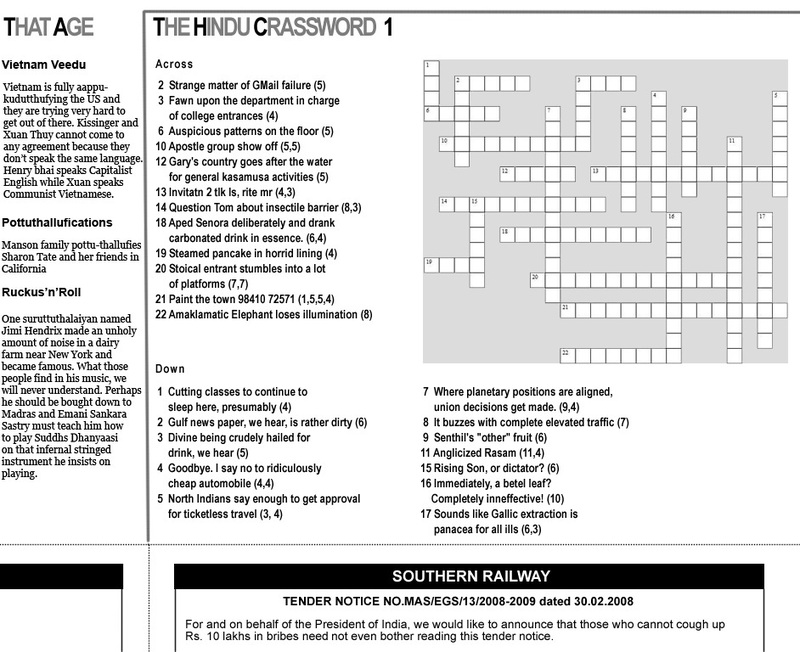 how would we design a Chennai-centric, contemporary English cryptic crossword for The Hindu? 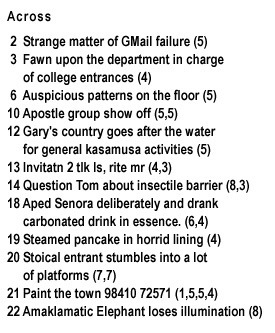 Plis to excuse for the poor quality clues and shady crossword structure for I am not a pro at crosswords. Perhaps she should start doing this. The solution will be posted early next week. Feel free to post answers in the comments section. Update: Oh well. Looks like Scudie , Praveen and Siddharth have solved pretty much most of it. So here’s the solution, along with the fundaas. 16 Immediately, a betel leaf? Even i have felt the same about these cross words over the years.Previously i used to sit down and try solving them but,only end up filling two blocks of them.It even went to the extent of creating a fear of ignorance in me. Now,let me try your crossword now.. The challenge is in learning trivia, about Poms, Ozzies, or learning words like billabong or taramasalata. So is the fun, but perhaps a quarter century of solving cryptic crosswords from the Times London and the Guardian makes it so for me. Now how do I submit my solutions to yours? And KA, clicking on your comments is like singing all the verses to the Hedgehog Song and waiting for the egg to boil, it takes absolutely ages and aeons. I’m just glad someone else sees how dull The Hindu’s articles are. The Deccan Chronicles goes one step further and publishes relationship advice columns from foreign newspapers! Even when they are completely inapplicable to Indians! No interactive java stuff? Boohoo. I suppose I am spoilt. Some that I could crack. Hilarious! 5. “Bus” – Like (???) or Bus – ride ??? Kudos! Your crossword is a sociolinguist’s delight. sorry I havent been the samathu payyan types who solve crosswords. To me it seems like a chessboard gone wrong…..
As a cryptic crossword enthusiast, I partially agree with you regarding the use of certain outdated and irrelevant acronyms in The Hindu Crosswords. 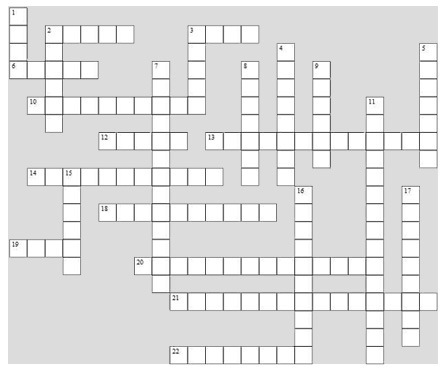 The weekday crosswords are not set by a single person, and every compiler has his or her own idiosyncrasies which has probably come through after years and years of solving crosswords from British newspapers and slowly getting used to their style. The Sunday crossword is a direct lift-off from a British newspaper, and so you really can’t fault the usage of British-centric terms in it. Remember that the Sunday crossword which goes without solution for a week is supposed to be tougher than the weekday ones. The other ones are making me lose sleep.. Especially Amaklamatic Elephant.. nnngghh!!! Praveen.. P James Magic Show! flabbergasted..
Krish, boss.. neenga engeyo poiteenga..
indha go figure na enna? sight adikardha apdi stylea solreengla? scudie, serious a kaekkareengala, illa leg pulling a?? As I said, it depends on what the compiler has been exposed to in his formative years as a cruciverbalist..
late entrant! but had a tummy aching time reading the answers to the clues! Che. Slicha late. I got most of across (except Soda) and the downs (not the feathers) that I tried – knowing that you’d have got answers already. Weekly feature in the making? Totally agree with you…worse than the daily ones are the Sunday Literary crosswords!!! You warm the cockles of a crossie veteran’s heart! I grew up doing the Hindu cryptic crossword, and spent much time wondering about their abbreviations. Over the past few years, I’ve been doing the ET crossword semi-regularly, and it is no different. You’d see words like “odd”, which you’re supposed to translate to “rum”. I doubt anyone since PG Wodehouse ever used that term. Just saw this one – unfortunately, AFTER all the answers have been put up… would certainly have liked to try it! You’d be the samaththu son my parents never had. Many a happy day will you have spent doing various cryptics. Needless to say, Sooober apu! The Hindu is boring I agree. Hope u come up with more “crasswords”. Super!! cha, soonapaana nu oru blog-a redulara padichiyum enaku adhu thonaama pochey..
thanks for the link to my blog, makes me wanna write something regularly..
from ramayanapedia to crasswords..thx for giving us the weekly dose of entertainment..
:). As usual extremely innovative. Here is a few more for the madras tamil experts. Admittedly, these are shadier than your 22-down. Ashok : I am not the defence counsel for Mount Road Mahavishnu, but I am personally acquainted with a Chennai gentleman who has been devising the MRM crossword for the last 15 years. Perhaps they do copy / paste from The Guardian occasionally but not all the time. btw, i love hindu crosswords. TOI’s is too tough. This is just right for me. and its anachronistic or archaic only for under-35’s , its fine for ppl above 45 . mebbe Hindu cud come out with 3 x-w’s: over-45’s, youth, and a toughie . Much as I’m out-gilmaed, that’s a good localized version! 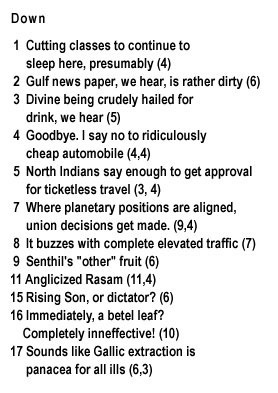 Incidentally there have been a few localized versions of the cryptic – The Pune Times (and even Bangalore I think) had one. Except, it was so ill-conceived, you just wanted the guy to go back to standard. I’ve mentioned a guide & a (now almost dead) mailing list on this page if you like solving.